Debunking the three most common myths about life insurance if you smoke, or used to smoke. Although smoking is nowhere near as common as it once was, the Government of Canada estimates that there are still millions of Canadians who regularly smoke (about 4.6 million) and even more who have kicked the habit for good (about 7.8 million). In all, that means about one-third of Canada's population has smoked at one time or another and that's a whole lot of people who may have concerns about their premiums when it comes to getting life insurance. These concerns, however, are often based on myths and end up discouraging people from getting the life insurance they may need. As a smoker, you may think getting life insurance is too expensive. While it's no secret that life insurers provide coverage to smokers at a higher premium than non-smokers, it's likely far more affordable than you think. That said, there is certainly no denying non-smokers get a premium break on their life insurance rates compared to what smokers pay. 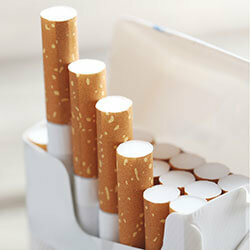 Even so, depending on how much you smoke, your premiums may be less than what you spend on cigarettes each year. Lowest quote offered online at Kanetix.ca in January 2019. Premiums have been rounded to the nearest dollar. If you're one of the millions of Canadians who have quit smoking, you might think your life insurance premium would take into account the fact that you once smoked. The truth is however, if you've smoked your last cigarette for good, many life insurance companies consider you a non-smoker once you've been smoke-free for a full year. If the last time you lit up was a more than a year ago, usually now you'll be able to get some of the best life insurance rates possible. Waiting until you've been smoke-free for a year to get non-smoker rates for your life insurance, is a risk no one should take; especially, when premiums—smoker's premiums—only costs a few dollars a day. It's better to have life insurance in place, should the worst happen, then no coverage at all. What's more, you can always revisit your policy with your life insurer once your smoke-free status is official. If you've been putting off getting life insurance because you smoke or once did, don't let the misconception of high life insurance rates deter you any longer. No matter what your smoking status, at Kanetix.ca, you can easily and quickly compare life insurance quotes to speak with a licensed life insurance advisor who can help you get the coverage you need at an affordable price.